This seemed to be an orphaned page from one of our newsletters. It was in the stuff Carl Frisch sent me on CD. Recently it came to our attention that South Dakota also has a Rock and Roll Music Association which has its own hall of fame. Our good friend, Carol, from Worthington, sent me the link, and we have started inquiries. As this newsletter shows, two of the weeks from October 25th through November 6th we played an engagement at Hackett’s Hideaway in Yankton, South Dakota. 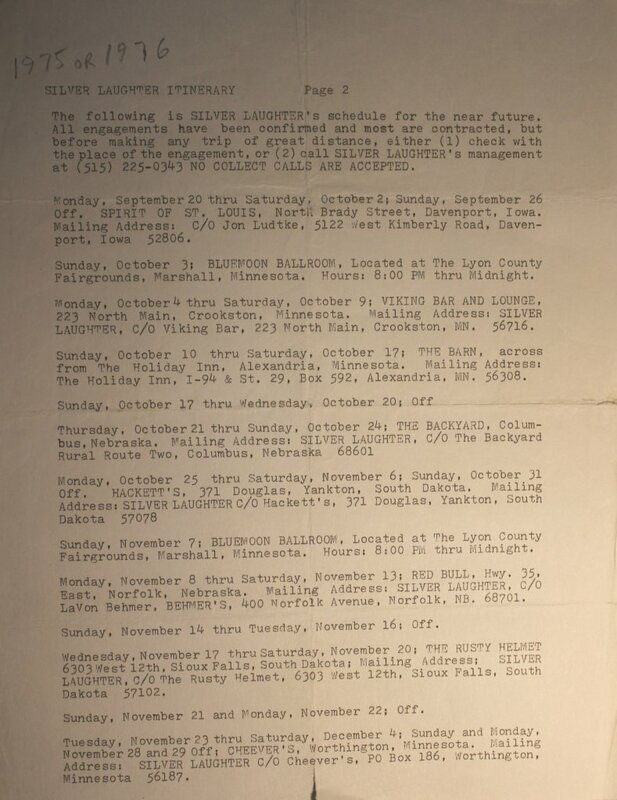 Then later on November 17th through the 20th we spent four nights at The Rusty Helmet in Sioux Falls. Other itineraries show us playing many more spots in South Dakota. Friends from places close by (or not so close) in Minnesota, Nebraska, Iowa and North Dakota often made the trip to see us in these venues. Perhaps we can start a campaign to get Silver Laughter inducted into their Hall of Fame as an Out of State Band. We certainly would qualify! Go here to drop our name into the hat!